I've got a green beauty for you today. 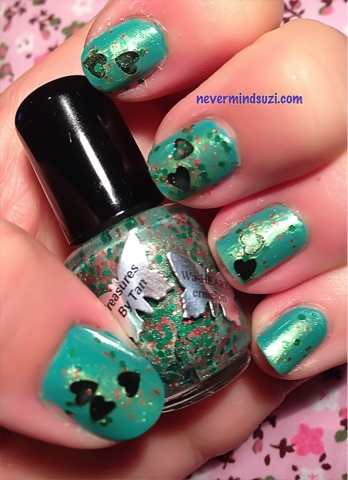 Wa-HEART-ermelon is a clear base with a green shimmer (that really highlights and has a slight duochrome effect), mini pink squares, green hexes and black heart glitters. It's unlike anything I own. I popped this over China Glaze - Four Leaf Clover and it colour shifted the green and really made it pop! The name is so perfect as it really does resemble a watermelon, especially the black hearts as pips!